“Ch a ca Quy Nhon” (Quy Nhon fish paste”, a specialty of central Binh Dinh province, has been recognised by the Asian Records Organisation (ARO) as one of Asian specialties. According to local authorities, in November last year, “Banh canh cha ca Quy Nhon” (rice spaghetti with fish paste) earned “The worth of Asia Cuisine” recognition from the organisation together with nine other specialties in the country. However, the provincial Department of Industry and Trade said that “Banh canh cha ca Quy Nhon” is only a single dish using “Cha ca Quy Nhon,” which is much more popular in the locality. The ARO accepted a proposal from the Viet Nam Records Organisation to replace “Banh canh cha ca Quy Nhon” with “Cha ca Quy Nhon”. Representatives from the India-based organisation will come to Viet Nam on March 22 to grant the certificates to localities which are home to the recognised specialties, including “Cha ca Quy Nhon”. 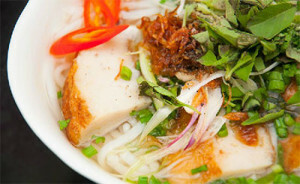 The others dishes include Hanoi’s Cha Ca La Vong (La Vong fried fish), Hai Duong’s Bun ca ro dong (Vermicelli with anabas), Quang Ninh’s Cha ca muc Ha Long (fried Ha Long cuttlefish), Quang Nam’s Cao lau Hoi An (Hoi An noodles with barbecue pork, bean sprouts, and herbs), and Kon Tum’s goi la (salad made from almost 60 home and wild vegetables and plants, typically served with pork). Also in the list are Dinh Duong’s banh beo bi (small round rice cookies served with pigs’ dried skin) , Tra Vinh’s bun suong (rice noodle with worm-shaped fried fish paste), Tien Giang’s hu tieu My Tho ( My Tho noodles with seasoned and sautéed pork), and An Giang’s Chau Doc bun ca (Chau Doc fish noodles).